As a lifetime Dodger supporter, 2004 stands out as one of the most unique years in YKI’s fandom. The double play combination of Cesar Izturis and Alex Cora was the slickest fielding duo in the league; the precocious Jayson Werth was an unproven commodity (and former catcher) splitting time in the outfield with Jason Grabowski, and chants of “Hee-Sop Choi” would fill the Chavez Ravine nights, when the Korean was filling in for Shawn Green at first base. Adrian Beltre was challenging for the MVP, and Steve Finley – once the bane of Dodger fans’ existence – was the reason the scrappy, gritty, Jim Tracy-led Dodgers won the National League West. 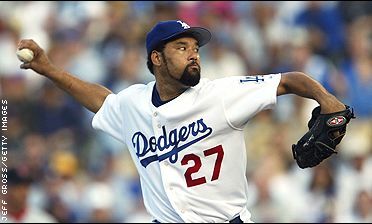 With a pitching rotation of Kaz Ishii, Jeff Weaver, Odalis Perez, Hideo Nomo and Jose Lima, the Dodgers pieced together a marvelous string of 3-2 and 2-1 victories on their way to the crown. Flash forward to October 9th, a breezy night at Dodger Stadium. YKI was in attendance with wife-to-be, designstILes, desperately seeking the first playoff win in the proud organization’s history since the Miracle of ’88. Jose Lima, castoff of four organizations (including the independent league Newark Bears) was the starting pitcher, fluttering curveballs & sinkers on par with his beautiful merengue/salsa singing – dancing, diving, hipping & hopping every direction. Lima’s smile & positivity earned him the moniker “Lima Time,” and my father – The Count – was among the ardent supporters of the oft-maligned pitcher, who had been an All-Star (and 21-game winner) previously, but had bounced around from team-to-team, as his 88-mph fastball wasn’t exactly the dominating force necessary to be a no-brainer as a big-league starter. That said, Lima’s effervescence – and 13 wins – were huge contributing factors to that amazing season, and his quotes & veteran leadership (especially with the Latin players) were perhaps the reason that the Dodgers competed. On a daily basis, it seemed that the team was relying on ethereal factors to pull out victories, and Lima Time was one of the major reasons – his energy provided a boost within the clubhouse. Flash back to that night, against the Cardinals – Lima, seemingly outmanned against the Cards’ Matt Morris, took the hill and dominated in the Elysian Air. My wife and I cheered every groundout, flyball and strikeout, nevermind the five hits allowed against the soon-to-be Pennant winning St. Louis Cardinals. In tossing a shutout, Lima provided the Dodgers their first postseason win in a generation and Los Angeles was simply Laker-esque with Lima Time Fever. The Lima Era was truly great time to be a Dodger fan, and in the aftermath – even upon his unceremonious release – he has continued to hold a special place in the heart of the organization, as well as my family. The tragic death of the 37-year old is a shock to Dodger fans and the baseball community as a whole, and he will be remembered fondly for both his performance and positive antics; reminding fans that this truly was a game, but a game in which the righty loved to compete. Today, this week & this season, hit the dance floor with your best moves, smile & laugh, and keep the strikes coming – Jose Lima would want it that way. In Chavez Ravine, it’s forever Lima Time. And he sang one of the best renditions of the National Anthem ever! Man…how did this happen? Drugs right?